then am not it worth like heaven of course yes. 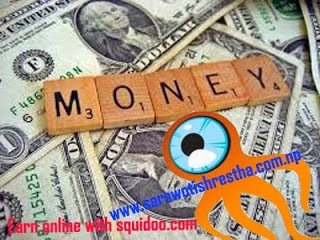 If you want to earn online without any investment then Squidoo can be the one of the best place. Are you having the Adsense approval problem or want to have some alternatives of Adsense without any big job then you can try Squidoo. Squidoo is the good way of solving the Adsense approval problem. Most of the people are going through the Adsense approval problem right now specially the beginners who really do not know the strictness of Google policies. So if you are one of them who is struggling from the Adsense problem then the Squidoo can be the solution for you. You can really use Ads on your articles these ads can be of any network like Amazon and many others. Indeed you cannot get the privilege as to own all yourself but it is not bad. You can generate passive income without any hair tearing problems. Now if we talk about the history and success of Squidoo then it we find many people behind it. We must say the founder and president of Squid has really done a great job by helping the beginners to share their knowledge and patience and indeed have the worth it. Squidoo is really a good place to earn some extra. Squidoo is really well planned and designed. It generally monetizes your creation by the Adsense or Amazon, etc ads. In brief, the people who join Squidoo create articles as per their wish and Squidoo monetizes the articles or in the other word it puts the ads on your article and you what happens next. The revenue that your content has generated is shared with you and Squidoo. So it is a simple way of generating passive income. You can have your payout as the minimum requirement is fulfilled and you can either withdraw your amount or donate it to the charity. So there are two purposes of creating lens in the Squidoo, one for extra income or for social service. How to make more money in Squidoo? Squidoo is also based upon traffic on your contents. Till you don’t have good traffic in your contents you are not going to get massive income. For the more traffic you need to create unique contents with excellent ideas that influence the users. I personally suggest you to create the lens about recipes, travel and social life because these are the best topics emerging nowadays in Squidoo. You can use Squidoo even to sell your own product or the affiliate product of ClickBank, CommisionJunction, etc. This will extremely help you to generate some bucks to have some fun. In the conclusion I must say Squidoo can be one of the best ways of generating some Passive Income and to have some bucks in your pocket. You can use it to make some interesting figures and have fun.